A year of preparation and today was finally the day! It is hard to even try to put in day into words, the anticipation, excitement, fear and yes plenty of Gatorade. I while managed to sleep a fair number of hours, I was restless with anxiety mainly of over sleeping and not the actual race. I awoke 4:15am and gather up all my remaining gear and joined the rest of the team on the shuttle over to race area. The street was only open for race participants, first I dropped off my special needs bags for the Cycle and Run then headed towards the body marking. It was still dark out and the street suddenly went from being crowded to gridlock with standing room only, as the lines for body marking began, it took 20 minutes to get through to the transition area. First I went to my bike pumped up the tires and filled the bottles,then over to transition bag area to put in last minute supplies. I also realized the one thing I'd forgotten was a towel to dry off after the swim, with quick thinking I decided to utilize my sweatshirt for purpose. I found the rest of the team and got into my wet suit. Meanwhile the event announcer's were building the anticipation with music to pump up the crowd and the participants. The next thing I knew I was heading down the start line in the water for the start. 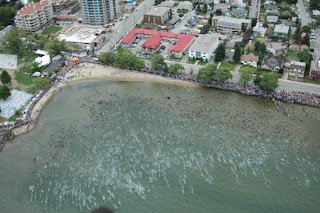 The swim start was like no other triathlon I ever done, a mass start with 2700+ people. I started close to front even knowing I would have a number of people swim over me, it also gave me the added motivation to swim faster, swim or be swum over. It was frantic, I was surrounded all I hear was the splashing of the water and everything else seemed to be a blur. I slow down and just look around it was an incredible sight and I was right the middle, trying to avoid being kicked or elbowed in the head. It should be noted that is is everything important to try and avoid concussion in this scenario. The 2.4 mile course was a triangle beginning and ending in the same place, to be honest I didn't really examine the course in detail before starting. 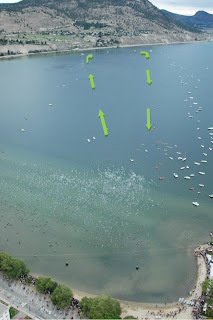 I just ask what I should sight for, on which side I should keep the buoys on basically just follow everyone else. After the first 30 minutes the gridlock traffic of the lake, let up some and I was now making my own way or did that just mean that I was going my own way? Well I look up and sure I enough I was dead on course about to collide with the buoy, I manged a quick correct and barely scraped by to should I say almost underneath the side (I'm glad it was not a metal one). Nearly two year at this whole swimming thing and I still haven't quite got the whole breathing down, this can lead to great deal of discomfort and lower performance, however I have learned how to burp while swimming which take care of things. At the far end of the swim there were large boats on which people were cheering from and before I knew I was was turning around and heading back to shore. The second half seemed to take longer everything still appeared to be a long way in the distance, but as I got closer I sped up and kicked more with my legs to getting blood flowing again. 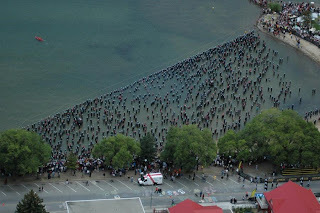 Finally I reached the shore which was lined with people all the way into the water, including the Ironteam staff in there instantly recognizable jackets with Green and Purple flames. I felt triumphant completing the swim as it is always one of the biggest challenges in my mind, though was still a long day ahead. 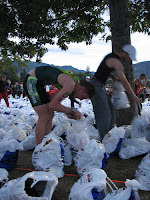 I ran out of the water to the transition area, where the volunteers pull my wet suit off me. I the picked my transition bag and ran over to the changing tent. Generally I'm every quick at transition and all I really had to do was put my socks, cycles shoes, helmet and sunglasses and run out of there, however there was something in the tent I was not expecting to see which I was not prepared for. It retrospected was cruel and unusual yet every alluring, yes in the tent they actually had chairs! I would strongly recommend that no one ever sit on a chair during a triathlon, because you'll like it, especially after a 2.4 mile swim which leaves your legs feeling a lot like jelly. So I sat, relaxed a little contemplated the long line for the toilets, I quickly devised a solution to needing to pee and while maximizing my time sitting on the chair. It is amazing the things you'll do in race, compromises that you just don't make in everyday life, but I'll just say the I did make sure the chair was dry when I left it. Having lost a little time in the transition I ran to my bike and headed out on the road. 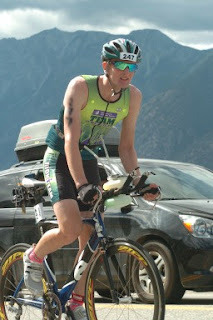 The cycle is without a doubt my favorite part of triathlon and I felt on top of the world as I started the ride. 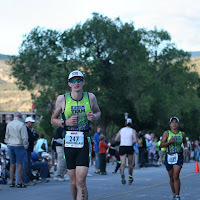 The streets were lined with people cheering, the adrenaline rush was immense though I tried to not let it take me over. 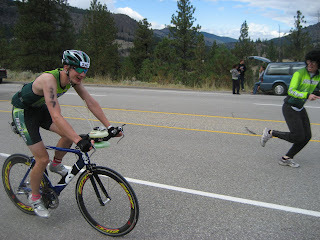 I was cautious of the drafting rules in place and with so many riders out I had to be constantly passing people to adhere to a 4 bicycle length minimum distance. The first 5 miles were through town and with a few major turns I had to be careful, I didn't what to wipe out at any point during the ride especially not the beginning. 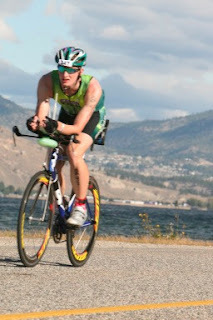 A number of my teammates are faster swimmers than me but I knew I could make up the time on the bike. It was great to see my fellow teammates on the cycle course, it wasn't until midway through the cycle I catch up with some and of course there is always one or two you can't catch. I was reserved on the bike, I knew going out to hard to ruin my chances of having a good run so I worked on keeping a steady pace. The first 40 miles were generally flat or downhill which made of an average speed of 26mph, I felt great and hoped it would continue that way. However I knew the hills were coming and they sure came. I began the first climb and tried to keep a good pace and my heart rate low, but realized I had to slow down, the hills were just going to keep coming this was not a sprint. With the hills also came crowds of people to cheer everyone on which on a long hill is much appreciated. After the first big climb on the ride there was nice decent followed by some rollers, my pace picked up again and soon enough I was headed on a long out and back to the special needs area at mile 70 where the bag of supplied I had dropped off had been taken. Inside the bag I had a spare inner tube, a bottle of Gatorade and variety of food including, a sandwich, Pringles, Oreos and homemade Chocolate Chip Cookies (with coffee as the special ingredient). I quick had a bit of everything and left within a 5 minutes. Coming away from the out and back I was hit with headwind which is very discouraging, will the road was mostly flat it felt like I was climbing. I got the chance to see a my teammates again heading in the opposite direction, it was great knowing I was not out there alone. Back on the main loop of the course it briefly started to rain and I was about the start the biggest climb of the course. While the weather conditions appear to be worsening I didn't let that get to me, rain is not a deterrent for me having grown up in Scotland. 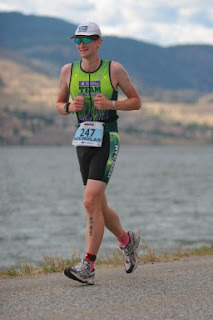 I had been managing fluid and calorie in take well a long the course and was still feeling pretty good. The main climb sneaks up on you, it starts every gradually getting steeper and wearing your resistance down. At one of the water stops up the hill a couple of guy's were hold up a sign that said "Smile if you peed on your bike", although I hadn't reading the sign raised my spirit and I smiled. As I past by I heard "Don't worry your not the only one". The next few miles to summit dragged on, but I was rewarded at the top with the support of Ironteam were on the top of the cheering in full cheering force, complete in one case with a wig and silly glasses :-) This was the best part of the ride and knowing I had a ten mile decent to on the back to the transition made it even better. One thing that was concerning my was an occasional some shooting pain I'd been having in my knees, towards the end of the climb. I had to take easy as I finished the remaindered of the ride. The decent was great and just what I needed, what came a as surprise was the rain in Penticton, where the roads were wet with some drizzle still coming down. As I got closer to the transition the Cycle course overlapped the Run course I could see what faced me next. My Bike to Run transition quicker, but the seat did have me for a couple minutes again and I also took the time go the restroom as there was no line. With another heavy application of sunscreen for the volunteer staff, headed on to the run. While I had been a strong runner earlier in year, injury through over training had kept me away from running, my longest run in the past few months has only been 14 miles. With some pain on the bike, I was mental preparing myself for a painful run which I may end-up walking to finish. 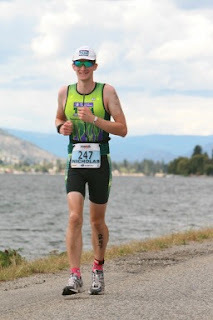 As I started the run it was easy to put those thoughts to the back of my head albeit briefly as the crowds cheer everyone on, I knew I just had to keep smiling the rest of the no matter what my body was feeling and I'd be fine. The first mile marker I saw was for mile 25! Had blocked out the last 24 miles of running was it nearly over already? Unfortunately it was just the way the course was designed there were a couple of turns at the beginning which takes you to an out back and back which goes right by the finish line, which at least means you have accurate picture in your mind for the end. My pace was about 8mins 30secs per mile as I ran the first few miles through the town. I actually felt pretty good the first 6 miles, the people in the town were great and I even saw a few friends cheering as I went down the main street. However the next thing I knew I was exiting the town to the long and lonely run all the lake. The temperature was good the made a appearance a couple of times but thankfully remained in it's place behind the clouds. It was just about taking things one mile at a time I was now on a 10 minute pace which was great timing from a hydration stand point, I got some Gatorade as I went through each stop, I also started switching off Gel to more natural foods, like Bananas and Oranges which were able at the stops. Towards mile 12 there was a large climb on what had appeared to be a mostly flat run course and my feet agitated like there was something in my shoes, the something was just blistering. At this point I was a couple of my teammates heading back from the turnaround I knew it wasn't far and I'd soon have my special needs bag, a nice reward for the hill. There were loads of people in the turnaround area cheering and I picked-up my bag and tried to eat food without stopping, it turned out I didn't really any "special needs" at that time, didn't really use much of the food in the bag and discarded it quickly. The turnaround point really was a in way a turning point me in every sense, I knew I just had 13.1 miles to go I just needed to keep up the pace and what better way that to know you have people right be you. I must give notable mention to my teammate Brenna who was right behind me at the turnaround and that is when the chase began. Also as I reach mile 14 I saw another couple of my teammates who also good runners, I knew anyone of them could catch me in the remainder of the race. For the next 3 miles, every time I looked behind me Brenna was never too far off, although my body wanted to slowdown and was starting to tell me "Hey what the rush? ", my competitive instincts were also at play and were edge out the exhaustion. 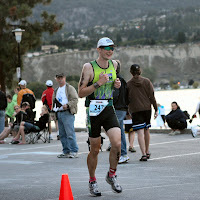 Mile by mile now the end was getting closer and by mile 20 I reached Penticton again and proclaimed out loud "Penticton, the promise land of the finish line", very quietly of course I didn't want anyone to think I was delirious. As I hit mile 22 I met Coach Mike, who was out on the course on a mountain bike, it said I looked good "Slow and Steady", I said "Hey, not so much of the slow" as I picked up my pace a little, my heart rate picked up to at which point then slowed down again. As I reached the main street again, it was definitely quieter than before. There was also something I hadn't noticed on my way out, there was a small but definite incline on the main street. 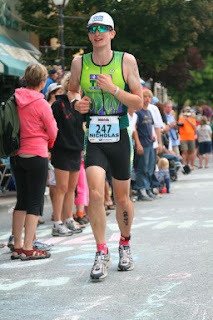 I wasn't looking good or feeling all that great over the last few miles as the pictures show. On the final mile little did I know Brenna was now right behind me and about to pass me. I really didn't have much left in me at this point, but knew I was close it is was time to go all out and finish strong. With burst of acceleration I changed my pace from 11mins down to 7mins, that was just enough to catch and pass Brenna again, we passed opposite directions we high-fived other each. With the end right ahead of me, a long year was coming to end, the experience had been a amazing and challenging from start to end. 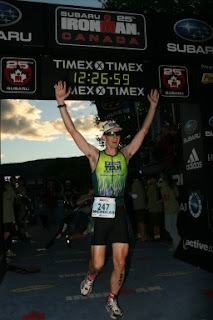 I ran in towards the finish line and finished triumphant, with a finish time of 12 hours, 26 minutes and 59 seconds. I would like to thank my Coaches and Team for helping me train for this incredible event. I'd like thank my friends and family for understanding why I've been so busy this past year. Most importantly I'd like to thank everyone who contributed to Leukemia and Lymphoma Society, in support for me, with your help I've managed to raise over $11,000 for research and patient services.